A portrait of Fremont Leidy, the son of Abram and Martha Leidy. 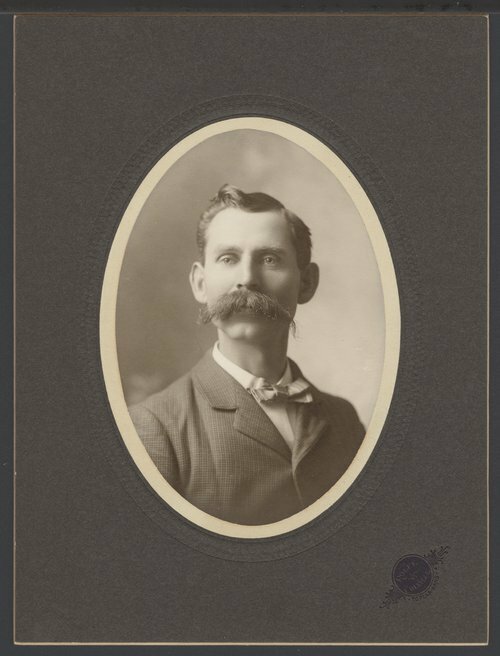 He grew up on the family farm in Butler County, Kansas, attended high schools in Augusta and El Dorado, and graduated from Fort Scott Normal School in 1887. After graduation he accepted a position as principal at Severy Schools and two years later the superintendency of the Augusta schools. Three years later he entered law school at Kansas University and was admitted to practice in 1893. He opened an office at El Dorado where he practiced a short time. Health issues forced him to leave his law practice and he started a farm. In 1900 he was elected to the Kansas Senate, representing District 25 in Butler County and served for two years. Governor Stanley selected him as a member of the text-book commission. In 1908 he was reelected to the senate. On June 27, 1910, Leidy was appointed United State revenue collector for Kansas. He married Myrtle Jenkins on July, 1893 and they had three children: Pauline, Richard J., and Roger. Myrtle died on July 22, 1906 and he married A. Zota Martin on September 9, 1914.